At Hatching Results, we know that the work of designing a school counseling program requires an intensive commitment of time and talent and can vary from location to location. Typically, full implementation of a school counseling program aligned with the use of data, evidenced-based practices, and the ASCA National Model takes a minimum of three years. Our Three Year Comprehensive Training package is our most requested plan. By the fourth year, our goal is to establish a professional learning community and “Trainer of Trainers” model to ensure sustainability and to increase readiness for district sustainable leadership. Some of our districts have applied for and received the American School Counselor Association’s RAMP (Recognized ASCA Model Program) recognition. Based on your districts needs, goals, timeline, current implementation status level, and other factors, Dr. Hatch and her expert team will collaborate to provide the personalized services your district needs and to define a professional development schedule grounded in co-constructed measurable objectives. To view our training overview, click here. A series of 6-8 full days of professional development per year typically provided to a district as part of a three-year approach to reform. Customized to meet site and district needs, these packages may include school site visits, online and/or in person coaching, needs assessments, program evaluation, a School Counseling Program Handbook, support for policy revisions, administrator training, board presentations, etc. 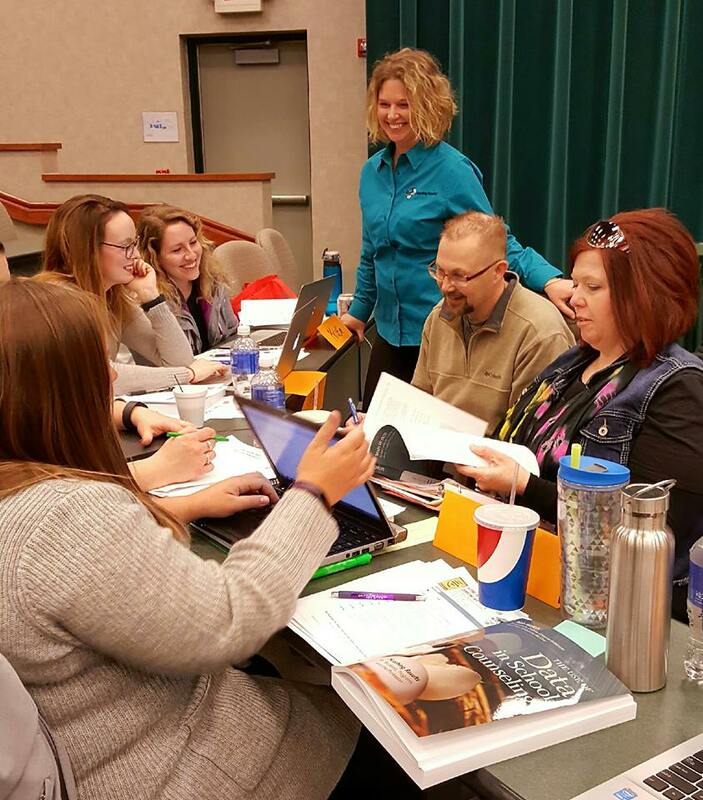 A professional development series (typically 6-8 days per year) provided to a district to support specific needs of school counselors in implementing a comprehensive data-driven program. This can also be onsite training of a brief duration (1-4 days) to cover specialized topics such as College and Career Readiness, Ethics and Law in School Counseling, etc. A professional development series (typically 6-8 days per year) provided regionally or at a county level to support multiple districts across multiple days in one or more years, in accordance with other deliverables such as online learning and a School Counseling Program Handbook. Based on The Use of Data in School Counseling: Hatching Results for Students, Program, and the Profession (2014), online courses contain instruction from Trish Hatch, Ph.D., with supplemental readings, activities, and quizzes to test knowledge and deepen the level of understanding and utilization of data to get desired students outcomes. Courses are offered in two formats: self-paced and facilitated by a trained instructor. This also includes webinar training. Dr. Hatch has successfully authored and evaluated over $16 million in federal and state grants for school counseling programs. Her training and evaluation services have led to sustainability when grant funds ended. For more information on grant writing and evaluation at the elementary level specifically, review this here. Dr. Hatch has delivered countless unforgettable, inspirational public speaking engagements, including keynote addresses to set the underlying tone and core message of the event, pre-conference full-day workshops, conference breakout sessions, and panel discussions. As an administrator, I have not had training with counseling and I learned more in the two days than I have learned in my time as an administrator. I hope this catches on and we can unify as a state so all of our schools are going in this direction. Trish Hatch is a rockstar and a living legend! As a Counselor Educator and passionate advocate for our profession, I believe strongly that her ground-breaking text, The Use of Data in School Counseling, and the subsequent professional development training I attended today should be required for all in-service & pre-service school counselors. Her cutting-edge, hard-hitting work demands that we stand up and make positive & systemic changes for the betterment of our students. Thank you so much! I can’t even begin to tell you how much you changed my life today! For weeks I’ve been saying that we were doing great things without a real sense of purpose. I knew I enjoyed using data, but I felt disconnected from the big picture and only had a view of our profession on a minor scale… and desperately needed more! I now know and am eternally grateful! I owe you and I owe our amazing profession. In my ten years as an educator these past three days of training were the most concise and useful time that I’ve ever spent in a meeting. It was well worth three days of my summer vacation because I now have the tools necessary to take our counseling program to the next level.